This further solidifies the nation that Y-range fanless CPUs are the way forward for 2-in-1s. I will say that it is satisfying seeing a device like the V going toe-to-toe with the ones from Dell and Microsoft, but already winning on counts like battery size and port selection! It’s kinda funny that this device will only have USB c ports for USB ports actually , but I guess we can “thank” Apple for starting that trend… I guess it does make the decision to have two in the V look better now, though ! Just saw that picture… and it’s a terrible tablet, I tell you. That one short glance was enough to decide that it’s TERRIBLE to use this thing as a tablet. it may not need them, given how thick it will be with the keyboard still attached in tablet mode. lol. I wouldn’t mind the thickness if it added some computing power to the mix (like Lenovo Yogas with dGPU). But this one is fanless and of course no dGPU… So the thickness doesn’t make any sense. Even if it was really thin, it would still be unusable. Well it is a laptop-first 2-in-1 with a normal keyboard so it’s to be expected. I actually was really torn about whether to buy a V perk or wait till Dell announces its new XPS 13 line but now I’m glad I stuck with V.
No, if it was “just” a laptop, then it would be expected. But now it’s a convertible. I’m not paying for the “feature” of turning it into a tablet if it’s unusable in tablet form. I’d rather get a regular laptop without a touchscreen and save almost a thousand dollars, because I wouldn’t be able to properly use the touchscreen anyway. A bit of something for everyone I guess. But personally I am in the same boat as you, I wouldn’t buy a device in a laptop form-factor with a touchscreen, seems kinda redundant for my needs. I can see it being appealing for artists who want a real laptop (more power) but still be able to draw on the thing. Though I’d want a discreet graphics card then. true. I was referring to the form factor though, not this particular laptop. Idle: 16h 11m (16.18 hours) runtime would imply an average power consumption of 2.84W. But this makes me very confident that the V will have a great battery runtime. 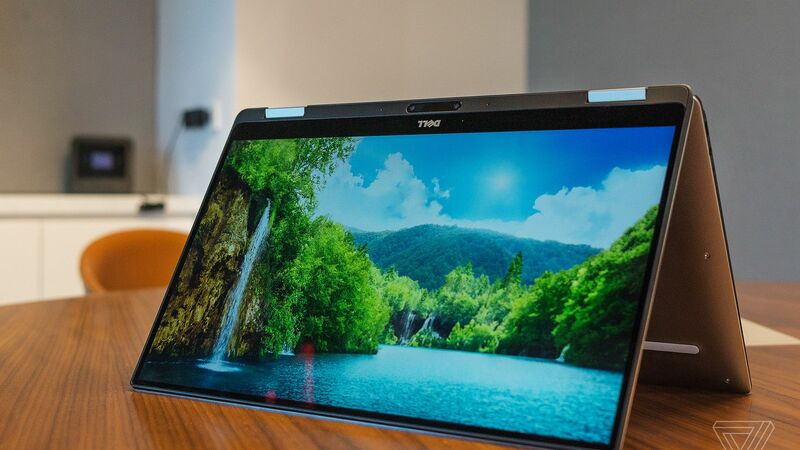 Outdoor readability of the Dell is mediocre, brightness in only 302 nits (Eve V has a promised brightness of 450nits and a special anti reflection coating. Btw, I’m soooooo eager to see that in action!!!). Why Dell? Why are you runinig this otherwise great device with such a screen? There are some pictures of the screen in sunlight in the review (see links below). I agree that we have a good chance - if I recall the Dell does not use IZGO screen, and so V should be brighter for the same power. Also, I think Dell tries providing higher thermals (6W). If my understanding is correct, then I think we have a good chance of 10-ish hrs. If we get 12 hrs that would be amazing! Perhaps related, Perhaps unrelated as it is based heavily on the logic board manufacturer. Dell had been busy too long scratching their heads, and actually had to recall quite an amount of their XPS’s due to excessive (way above the documented standards) coil noise in the first iterations of their 2-in-1s, which was mostly generated by Intel related components. In case you missed that, and only if applicable, it might worth taking the hint and eliminating these possibilities, before they slip to mass production and before even anyone notices. Not that it will be missed for sure, but the earliest identified, the better the chances to deal with such events. As I seem to have proven in other threads, I’m not a techie on the level of so many here… lol. Can someone explain what “coil noise” is? It’s when electronics make high-pitch noise sometimes it’s just a long “beeeeeeeeeeeep” (very silent), sometimes it’s more like static noise… either case it’s very silent but can be a bit annoying if the computer is fanless. holy cow that would DRIVE ME NUTS! That is a light case. Also it didn’t happen in every device, but in Dell’s forum people frustratingly reporting they could hear it from the other side of a noisy room, in a work meeting. Of course this is speculative! and perhaps invalid. Yeah, two of my chargers do this. It’s horrible.